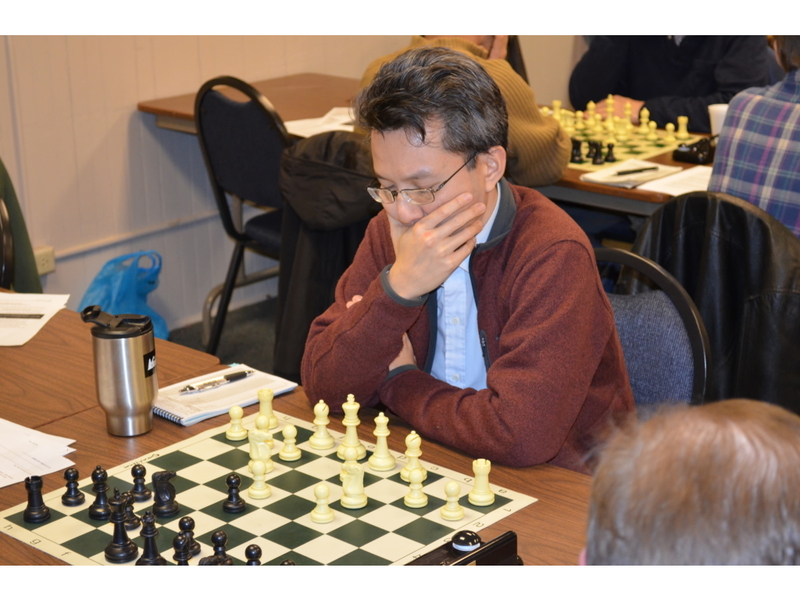 Pittsburgh Chess Club Championship 2013, Round 5: Surprised at move 4 of the opening! I coped well and played what I thought to be perhaps my cleanest game yet in this tournament. I report on the psychology of how to deal with opening surprises, and other turning points in the game. As I mentioned after last week’s game, for this week I was paired against Expert Richard Edahl, whom I had never played against before, so I had nothing special prepared against him. Furthermore, I was occupied with a personal emergency (Abby broke her foot late last night, so we spent two hours at the emergency room) that had me taking the day off work and not knowing for sure whether I was going to even make it to the game (we spent another two hours in the morning at the hospital for more X-rays and a plan for recovery). I managed to get done what I needed to do and arrive at the club for the game. In this case, since the “new” move was at move 4, not deep in some obscure variation, I was sure that the move was a bad one. So then the question was, how to punish it? I spent 16 minutes calculating a whole series of lines in depth until I convinced myself of why the move was bad and how I could prove it no matter what my opponent’s followup moves. Does Black lose a Pawn? However, I had to consider the possibility that Black could try to regain the Pawn a different way, with Qe7. Here, I had to find out why this move had to be bad (given my assumption that e5 in the first place was bad). Surely, if Black can regain the Pawn by chasing White’s Knight away, the position would be equal? So I offer this as an example of thinking a long time about a possible game continuation that did not take place, but could have, and therefore had to be considered. Do not panic when surprised in the opening; if you have prepared well, chances are the surprising move is a bad one, so just calculate out why it is bad. Even in a completely winning position, one small passive move could lead to the losing side having enough active counterplay to equalize. So after round 5, I am leading the tournament by an entire point, with a score of 5.0/6.0 going into round 6, and nobody else having 5.0 or even 4.5 points. This means that no matter what happens in round 6, I am already tied for first for the title of Pittsburgh Chess Club Champion of 2013. I could lose and tie for first; if I draw or win, I get clear first, no tie. For round 6, I am paired against Kurt Wallnau, who won a game against me in the last Tuesday night tournament. I get Black again. There will be some interesting psychology for our game, because just as in the last tournament, he needs to win in order to tie for first place: a draw leaves me the sole champion. Needless to say, I am playing in round 6 for the win, not for the draw. Although I would be very happy to become the clear Pittsburgh Chess Club Champion, prizes and titles don’t actually mean that much to me. My goal remains to play the best chess I can: a correct and creative game. Yes, I do. I enjoy it when I see my opponent, you know, really suffering, when he knows that I've outsmarted him. If I lose just one game, then usually, you know, I just really want to [gestures violently and angrily] get revenge. I can’t deny this part of chess. I lost to Kurt in the last tournament, so what can I say? I’m itching to win. By the way, check out former American prodigy Stuart Rachels’ fascinating essay on “The Reviled Art”. I enjoyed thinking for myself, outside of “book”, after move 4 in the opening in this game. I feel like I’ve been playing reasonably well in this tournament, and hope to conclude it with a good game next week.